I can’t photograph much farther from my subject than I did on the Milky Way image in my last post. And I can’t photograph much closer to my subject than I did these raindrops on an orchid in Lava Tree State Park on the Big Island of Hawaii. Early in the week I took my workshop group to Lava Tree State Park after our sunrise shoot on the Puna coast. We didn’t have great light (too much sun), but everyone liked the location so much that I tried to figure out a way to get them back. When we finally made it on our final morning it was raining quite hard when we pulled into the parking lot. No problem: rain showers in Hawaii tend to fall straight down, so it’s simply a matter of keeping an umbrella over the camera to take advantage of the perfect light. Lava Tree State Park is a lush, quiet 3/4 mile walk with a variety of exotic subjects along the entire loop. With a few other workshop participants I beelined past huge ferns, ghostlike lava-encrusted trees, and a host of colorful flowers to a field of wild orchids at the back of the park. By the time I arrived the rain had stopped, but not before decorating the entire landscape with sparkling jewels of water. 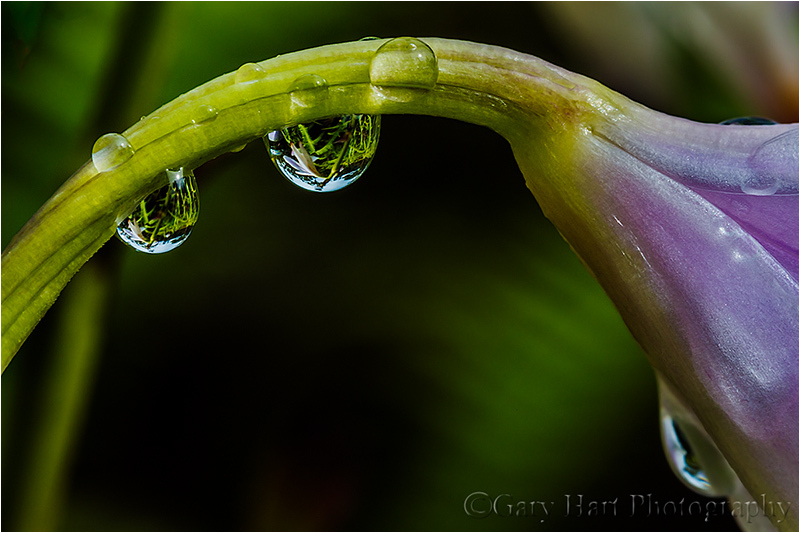 After two weeks on the Big Island, I had a great variety wide landscapes, so I was really looking forward to taking advantage of another of the Big Island’s great macro opportunities. I wandered a bit until I found this lone, bejeweled orchid, drooping beneath the raindrops’ weight. Positioning myself with the orchid juxtaposed against a wall of shaded ferns, I went to work. Figuring if I’m going to go macro, I might as well go nuclear, I twisted on my 100 mm and all three extension tubes. My macro is a pretty fast 2.8, but adding 72 mm of extension really cut the light—I knew I’d need to bump my ISO. Nevertheless, the wind was light to non-existent, and I had no qualms about bumping the ISO on my 5DIII to whatever I felt was necessary. For me the world looks a lot different through a macro lens, particularly when extension tubes shrink it even further. And every image is a process of capture, refine, capture, refine—this is particularly true of macro photography, when even the slightest shift of composition, focal length, or focus can completely change an image—so it was a few minutes before I landed on this little scene. But when I did, I knew I had what I wanted and worked it to within an inch of its life. For about forty-five minutes I clicked variations of this basic theme: a little wider, a little tighter, slightly different perspective, and a variety of f-stops and focus points. I usually limit my depth of field in my macro images to blur the subject’s inessential (less compelling) elements, but it this case I liked the way both the drops and the micro-reflection they contained were sharp at f16. I’m still in Hawaii, and as with the Milky Way caldera image, working without a mouse on my thirteen inch laptop, so I have no idea whether I’ve chosen the best version of this shot. But since I’m pretty happy with it, and it required virtually no processing, here it is.